No matter what income background you come from, you should always file the FAFSA. It may seem as frustrating as trying to take the perfect selfie, but it is worth your time. Free money: You never know how much you may receive. Your family may experience changes, and you may be eligible for more than you think. It’s FREE: It is free to complete the FAFSA. Filling out the FAFSA will take some time, but you could be in for a big surprise when you receive your package. Don’t wait: The sooner you complete the application, the better. 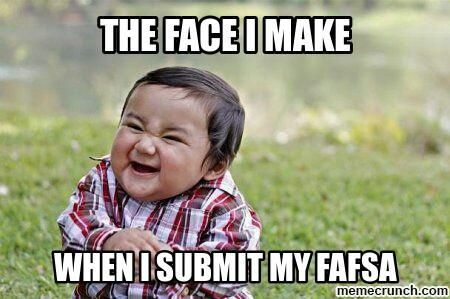 Do not wait until the last minute to fill out your FAFSA. Some funding is given on a first-come, first-serve basis. The earlier you file, the more grant money you may receive. No maximum age: Just a friendly reminder. There is no age limit for receiving Federal Student Aid. If you always wanted to attend college, this is the time! If you’re still worried, we answered all your FAFSA questions in this funny video. You can snap your friends and tell them to do it, too, when you’re done. With the perfect selfie, of course. Want to know more about financial aid at Saint Rose? Check us out.